NEW YORK, N.Y., Aug. 8, 2018 (SEND2PRESS NEWSWIRE) — Tenorshare upgraded iCareFone to Version 5.0.0.0, which has a completely new UI and perfect compatibility with iOS 12 and iPhone X/8/8 Plus. Tenorshare iCareFone is featured as an iPhone transfer tool, which is able to transfer iOS data to PC/Mac, backup iPhone to computer, restore backup files to iPhone/iPad/iPod Touch selectively, manage all data types in iDevice conveniently and rescue your smartphone from common iOS problems. An iTunes alternative to transfer music, photos, videos without limitation. Import Music, Music Playlist, Movies, Podcasts, Ringtone, Audiobooks, TV Shows from iTunes to iDevice and copy iPhone/iPad/iPod Touch media files to iTunes. One-click export photos to PC/Mac. Support moving all photos of all albums from iPhone to computer. Manage your Photos & Albums, Music & Ringtones, Video, Contacts, Messages, Apps, Books, Bookmarks by exporting, adding, deleting, etc. Selectively backup iPhone Photos, Videos, Messages, Contacts, Call History, Notes, Voice Memos, WhatsApp, etc. to PC/Mac. Store backups to local disk of computer safely. View backup files before restore then to iPhone/iPad/iPod Touch or computer. iOS system optimization & repair. Support iPhone X/8 Plus/8/7 Plus/7/6s/5, iPad, iPod Touch. Support iOS 12/iOS 11.4/iOS 11.3/iOS 10.3/iOS 10.2/iOS 9. The trial version allows you to transfer and manage only 10 files for free. 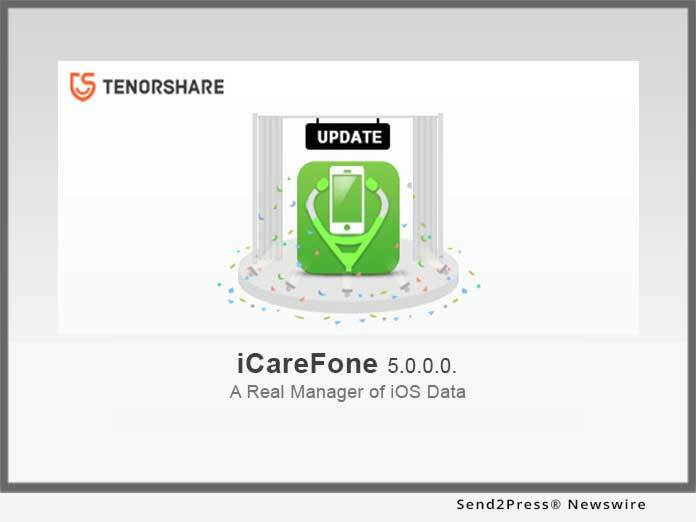 To transfer files without limitation, backup & restore your data instantly and save your iPhone from annoying iOS troubles, you can go to Tenorshare’s official website to get the newest Tenorshare iCareFone 5.0.0.0. The Windows version of this program is $39.95 and the Mac version is $59.95. "Tenorshare iCareFone is a real manager of iOS data," said Mike Lee, Tenorshare's CEO. "It is an all-in-one tool which provides iOS transfer, backup, restore, manage and iOS system fix."